No. 19 UCF made its long-awaited return to Spectrum Stadium on Saturday evening, overcoming a slow start to shut out South Carolina State 38-0. The Knights (2-0, 1-0 AAC) extended their nation-leading winning streak to 15 games with their win over the Bulldogs (0-2, 0-0 MEAC). The defense picked up its first shutout since the 2016 season opener, which was also a 38-0 win over South Carolina State. Offensively, the effort wasn’t a clean one. After a dazzling performance at UConn last week, Heisman Trophy hopeful McKenzie Milton looked less-than-stellar on Saturday. In the first half, he completed just 10 of his 23 passes for 130 yards and was intercepted three times. Despite Milton’s struggles, UCF quickly got a comfortable lead. The backfield picked up the slack, with junior Adrian Killins rushing for 87 yards and two touchdowns on seven carries in the first 30 minutes of play. Otis Anderson added 42 yards and a score of his own on eight carries. The Knights more than backed up the slow-starting offense with strong play from their defense and special teams. In the first quarter, redshirt senior Kyle Gibson made a big impact on both units. He first halted a South Carolina State drive with his first interception of the year. On the next drive, fellow redshirt senior A.J. Wooten blocked a field goal that Gibson recovered and returned to set up the offense inside the Bulldogs’ 30-yard line. A few plays later, Killins picked up his second touchdown run of the night to put UCF up 14-0. 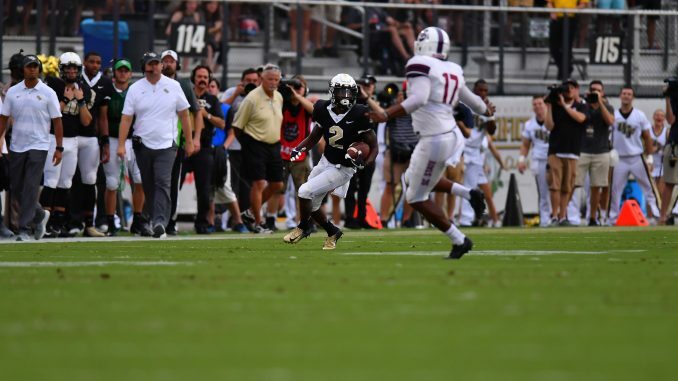 After carrying a 24-0 lead into halftime, the UCF offense looked smoother in the third quarter With 8:08 left in the third quarter, Milton found the end zone for the first time on a 13-yard pass to sophomore Gabe Davis. Davis led all UCF receivers with nine catches for 111 yards and the touchdown. One possession later, sophomore Greg McCrae broke through the line for a 32-yard touchdown run. With Milton and the first team offense on the sideline in the fourth quarter, the Knights were held scoreless. Milton’s second half was better than his first, but he still completed just 54 percent of his passes for 243 yards, a touchdown and three interceptions. As a team, the Knights rushed for 316 yards and allowed just 257 total yards in the shutout. Redshirt sophomore Richie Grant and true sophomore Antwan Collier both added interceptions in the second half for UCF’s defense. Weather permitting, UCF is set to hit the road next week to take on North Carolina (0-2, 0-0 ACC). Kickoff is scheduled for 12 p.m.